An early treat for the Holidays. Here is a sneak peek into the mind of The Pointed Man Band. Enjoy, share, HI FIVE! All that Krampus wants is high-fives for the holidays. He’s been so good all year cramped up in his chalet. His psychoanalyst said; “he could use some reinforcement, some positivity and a five fingered endorsement”. He’s laying down his birch twigs for something more substantial. He’s even hung his hoof warmers on the mantle. 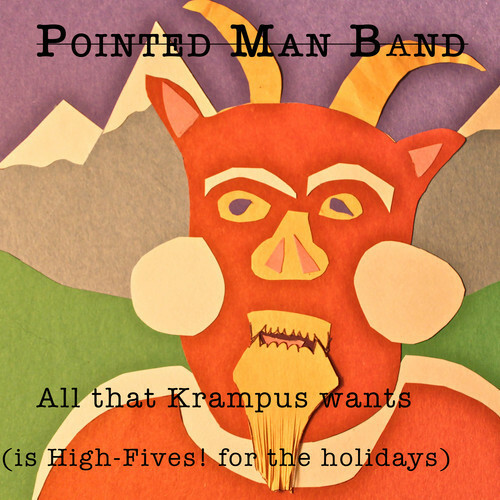 ‘Cause all that Krampus wants is high-fives for the holidays. All that Krampus wants are some fist-bumps from the missed days, when he was misunderstood and not on a righteous pathway. He’ll follow old St. Nick as his source of employment, but now his job description brings the children enjoyment. He’ll help to bring the gifts and finally he will sample all the treats left out all night on the mantle. ‘Cause all that Krampus wants is.. But here it comes, Oh, That special time of year! For the disembowelments, the torments and the tears. But, No! I won’t continue that for fear, that a relapse of my spiraling depression could become more severe! Posted in Music and tagged as familyfun, hi5, Krampus, music, musicforkids.